Have you ever visited your own city? Have you ever stopped to really enjoy it the way a tourist would? If you live in the suburb of a cool city, you might make it downtown for an event or a dinner, but what about really walking around and taking it all in? I have spent a lot of time in the beautiful downtown of Portland, Oregon - only most of that time was spent working long hours, or rushing somewhere on lunch breaks to run errands. When I worked downtown I used to tell myself that I should take more time to really look around more, but I was always too busy, or stressed, or distracted with making my way off a crowded rush hour train. This was my week to get out of the suburbs for a couple of days, and to walk around and enjoy all the things there wasn't time to enjoy before. The sun goes down behind the West Hills. tall black one on the right , and the smaller one behind it. Hawthorne Bridge under the Portland clouds. Little snowflakes land softly on the leaves of our front-yard bush. I caught these pictures in the early morning before the family got up. most of the night. It must have left in the very early morning. but their leaves are still busy catching snow. Today, it snowed on and off all day. The best days of winter through my life have often been snow days. Depending on what city or state I was living in, each place had its own definition of what was of enough snow to close things down. When I lived in Colorado, I was expected to be at work even if cars were sliding all over the road. Now that I live in Portland, Oregon, even a light dusting can cause places to close or at least cause a lot of people to cancel things and stay indoors. There's something distinctly beautiful about a light snowfall - you can still see the the beauty of nature without it being completely covered up and everything becomes highlighted by white. Snow and snow days seem like a good metaphor for grace. Life is going along with all the usual demands and all the sudden, everything is covered, everything closes down, and you are off the hook. For a day you are allowed to not be on time, you are allowed to not even be there, you are allowed to just be. It seemed like a good day to stay in, stay warm, and eat good food. I had put a roast in the crockpot last night before bed so it simmered all night, filled the house with good smells of bay leaves and the wine it was marinating in. We ate it for lunch with vegetables I roasted in the oven. A cold winter night demands hearty, spicy food to warm you and fill you up so I sauteed chipotle chicken sausage. To go with it, I made a stock pot on the stove of homemade vegetable soup. Spices went in, steam rose up from the shiny pot, and into our bowls it went. Gingerbread and eggnog are two of the best tastes of winter, so we chased down almond butter fudge with afternoon gingerbread spice lattes and finished off the day with homemade eggnog ice cream. A beautiful day of snow. A good day for eating. What moment in your Gen X childhood did you find peace despite the chaos around you? What place did you find where there was silence in the midst of all the noise? When I was a small child, my next door neighbor was just a year older than me. The top of her dresser was something of an epic Gen X childhood junkyard. Anything from Rubik's Cubes to Pet Rocks could make their way to the top of that piece of furniture. It was covered in countless snow globes and all kinds of trinkets and small toys that could have been found as prizes at the bottom of cereal boxes - whatever was trendy, cool, or interesting found its way there. Sometimes we would be playing together and she would leave the room for a few minutes. I would take advantage of the time and play with as many things as I could from the dresser top while she was gone. I'd pick up her snow globes, shake as many as I could, and become mesmerized as I'd stare at them and lose myself in these little worlds. There was such a peacefulness in the movement of the snow swirling and falling. I was sure that inside these little worlds --holding snowmen, little men skiing on slopes, and igloos -- were the safest, happiest, quietest places that could ever be. This Christmas I wanted to get my daughter a snow globe as a stocking-stuffer. It took me a while to find just the right one - one that I could pass on to her as a memento from my own childhood. I wanted to give her a little piece of the time when I was young like her, and a little bit of the peace that I felt in the moment of the swirling snow. While I was shopping, I found many ornate ones with music boxes built into them with all kinds of decorations on them, but this is not at all what I was looking for. 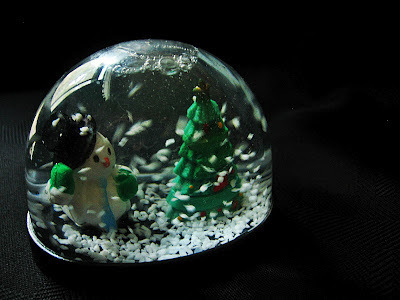 I wanted a snow globe made from nothing but plastic and water. I wanted the kind of thing you buy at a truck stop or a dollar store. This is how you digitally shake a snow globe: hit play. Since starting the Fireflies at Dusk project, I have looked back in time to bring back old things that were good about the past in my life and make them new again. I have also thought a lot about the present as I've been adding new traditions to my life and to the lives of those I love. 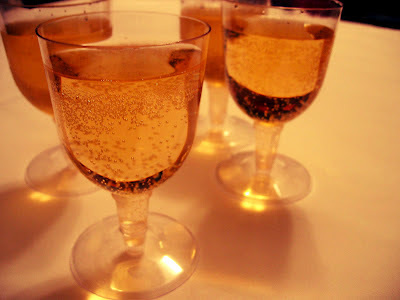 My husband and I have a tradition of having some really good friends over every New Year's Eve and I hope to continue that tradition as the years go by. It is especially good because while we can have a lot of fun, we can also talk about the real struggles of our life through the previous year in an honest and open way. This year holds potential that isn't just great, but is in fact, extraordinary. Just watch.